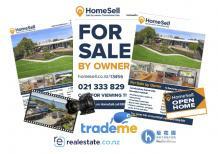 Selling your home yourself can be easier than you think � and with HomeSell, you'll get it right the first time. The information on this page is for the 'Marlborough, Kaikoura & Grey District' region. If you're selling somewhere else, click to change region. 1) Call or email us! We'll talk through the process over the phone or can correspond via email if preferred.